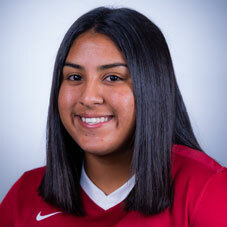 Played in all 24 matches, starting seven … Logged 857 minutes of play, scoring one goal and notching six assists for eight points … Her six assists tied for the second most on the team and was the second most of any Arkansas freshman … Totaled 37 shots with 12 coming on target (.324) … Took 24 corners, fourth most on the team, and also scored on one penalty kick … Made her first collegiate start against Abilene Christian (Aug. 27) and scored her first collegiate goal against Mississippi Valley State (Sept. 3) … Totaled a season-high two assists in a 6-1 victory over ACU, her first points as a collegiate player … Tallied a goal and an assist for a season-high three points against MVSU as part of an 11-0 shutout … Two of six assists came in conference play, both on game-winners against Mississipi State (Sept. 15) and Auburn (Oct. 5) … Played a season-high 79 minutes at No. 23 Texas A&M (Sept. 29) … Also saw 45 minutes of action, tallying three shots, in the NCAA Tournament First Round match at No. 21 NC State. Selected by TopDrawerSoccer.com into 2014 ECNL Phoenix Showcase Day 2 Top Players list … Selected into 2016 ECNL Player Development Program in Dallas, Texas … Played with fellow Arkansas signees Taylor Malham, Parker Goins and Haley VanFossen in club soccer. Rated the No. 142 player in the nation by IMG Academy as well as the No. 6 player in the South region and the No. 52 forward by TopDrawerSoccer.com … Reached quarterfinals with Jenks High School in 2016 Class 6A soccer state playoffs … Selected into TopDrawerSoccer.com ‘Best XI’ list from 2016 ECNL Texas … 2015 Tulsa World All-Metro girls’ soccer honorable mention selection … Led Jenks High to 2014 Heart of America Tournament final.